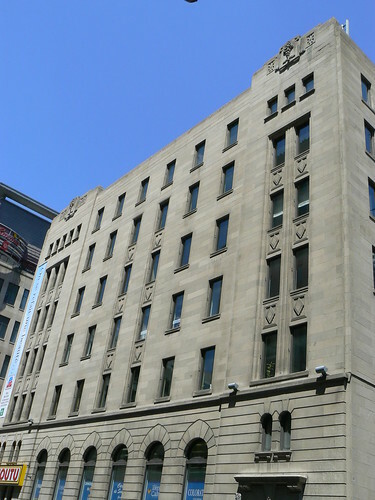 This branch of Pharmacie Jean Coutu on the corner of Ste Catherine and Metcalfe in downtown Montreal must have had a medical connection when it was first constructed. I say this because the decoration on the corners at the roofline feature caducei. 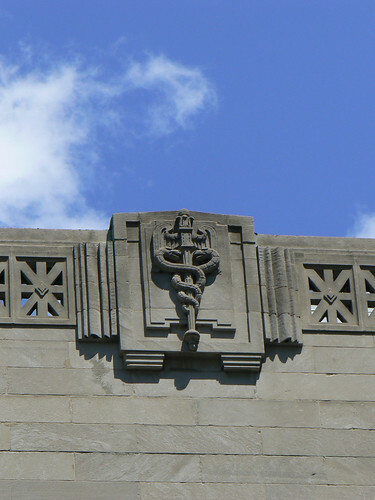 This view of the Metcalfe side of the building highlights the caduceus decoration at the corners and the diamond motifs below the windows. 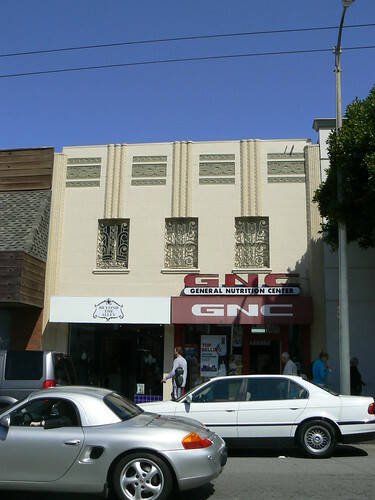 Here are a couple of shops in an Art Deco building in Chestnut Street, Marina. 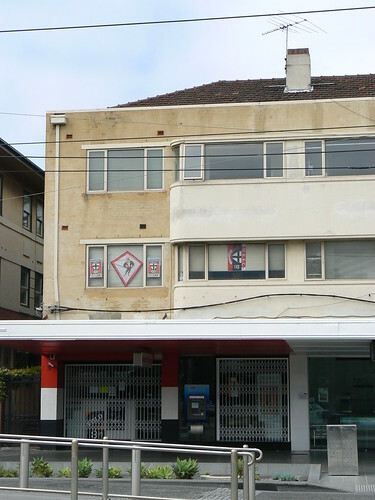 No doubt the shopfronts have been modified since the 1930s so all the deco beauty is above the awnings. Firstly there are three windows adhering to the Rule of Three despite the fact that one sits across the midpoint of both shops. 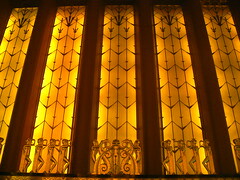 Each window has a beautiful decorative metal grill. Then above each of the three windows the decoration is then further split into three vertical columns. Again the Rule of Three comes into play. 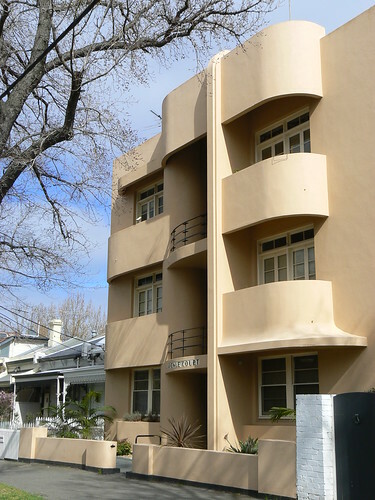 The four gaps on the façade above the windows each have a rectangular Art Deco panel. Again we can see the Rule of Three as these panels a divided into three horizontal section. The AFL Grand Final yesterday finished in a draw so the adventure continues for another week. For the people in this house in Elwood another week of tension and excitment. It was the wierdest feeling at the 'G' yesterday as 100,000 people stood stunned then chatting among themsleves as the players regrouped on the ground. The minute's silence when required on ANZAC day and the like is amazing when a big crowd is standing silently in respect but that noise after the draw will live with me forever. All being well I will be back there next Saturday afternoon still dreaming that the Saints can win it. 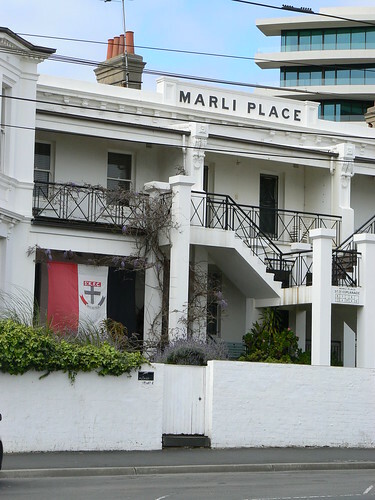 St Kilda have won their way into successive Grand Finals for only the second time in their 137 year history. In 1965 we finished top of the ladder and lost the Grand Final before winning the premiership, our only premiership, in 1966 beating Collingwood by 1 point. In 2009 we finished top and lost the Grand Final and today we play Collingwood for premiership glory. I will be among the 100,000 plus people at the 'G' today and I can only dream of what it will feel like if we are in front when the final siren sounds. 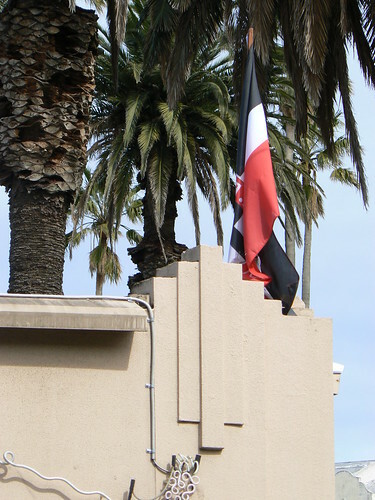 Last year I posted photos of 20th C buildings decorated in St Kilda colours so I've done the same this year, including some old favourites and some new ones. 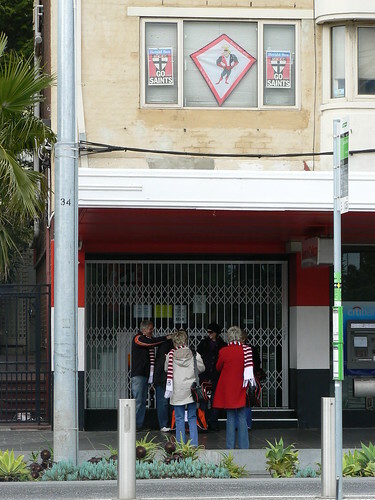 Saints fans posing for a picture outside a red, white and black shop in Fitzroy Street. 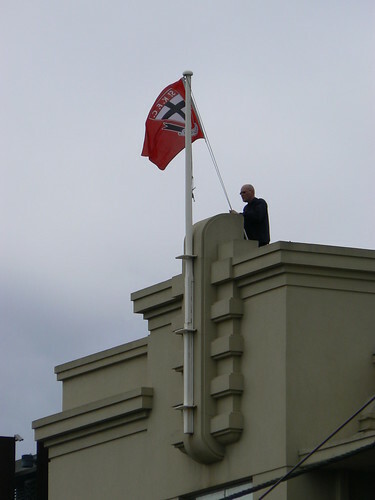 St Kilda flags on Vineyard Restaurant, Acland Street. I wonder if they decorated the lamppost as well. 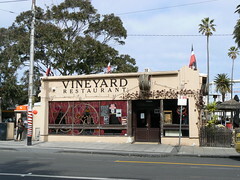 A Saints flag on the corner of the Vineyard Restaurant in Acland Street, St Kilda. 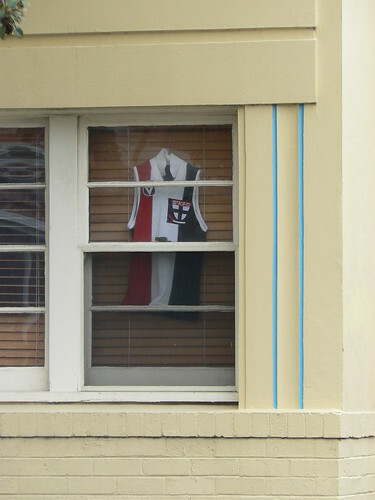 A St Kilda guernsey in a ground floor flat in St Kilda. 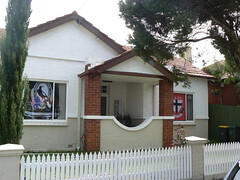 90s 'crusader' style St Kilda guernsey. 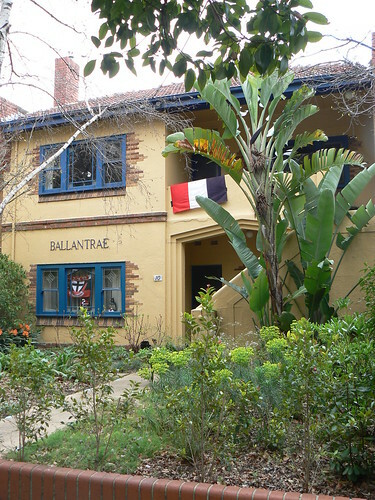 Very loyal Sainters in Ballantrae. 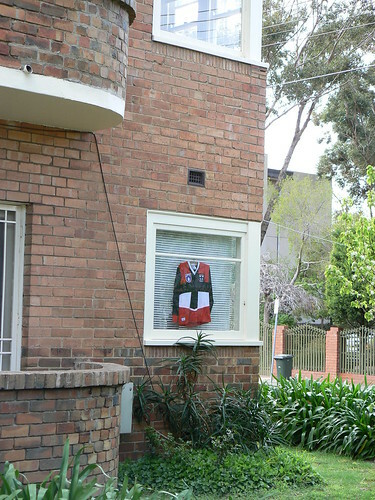 Old VFL St Kilda guernsey in the window of a flat in Middle Park. 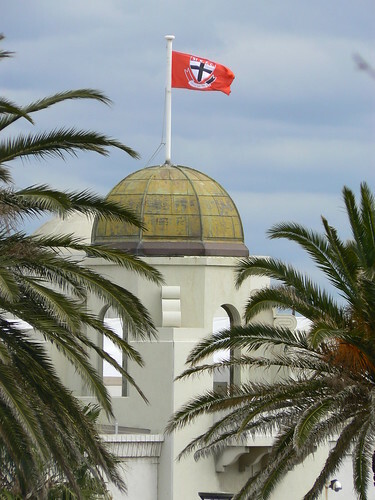 St Kilda flag flying over the St Kilda Sea Baths. 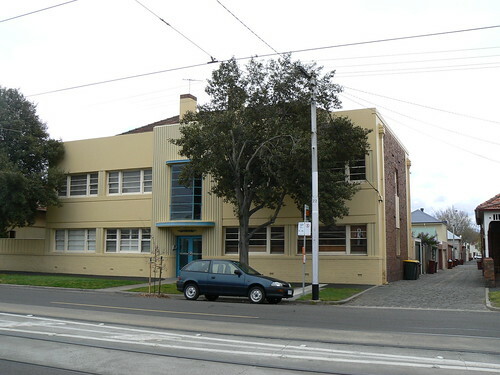 I've often driven past Avenue Court in Albert Park and been taken by the façade. At first glance it looks like the balconies on either side of the central open stairway but it is much more subtle than that. 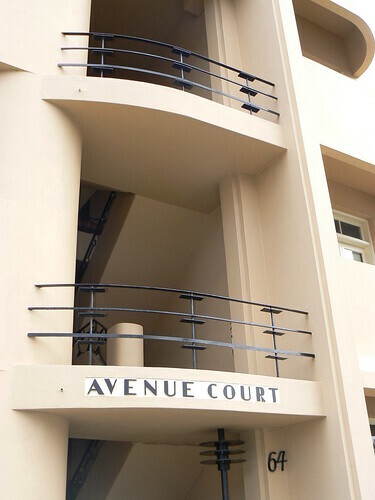 The curved parapret sits above the top right balcony and the central stairway providing shade for both. The balcony itself sits slightly higher than the landing of the stairway and I think it is this which fools the eye into thinking the balconies are offset. In fact they at the same level but the ones on the left of the building do not have the depth of those on the right so the are asymetrical in that sense. The pattern in the metalwork on the railings on each landing is also used in the small front gate. 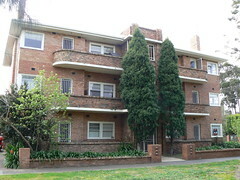 Avenue Court was designed in 1934 by IG Anderson and has been assessed by Heritage Victoria as Significant at a State Level. 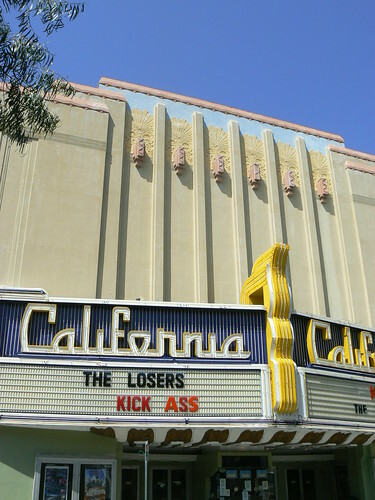 The California Theatre in Berkeley, California or The Cal, as it is known locally, was built in 1920 as a T&D Theatre offering live shows and films. 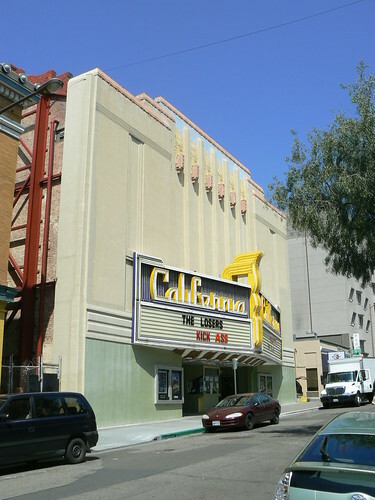 It was originally designed by Albert W Cornelius but was renovated in the 1930s taking on the California name. The roofline is slightly stepped and with each step the front wall also steps out. 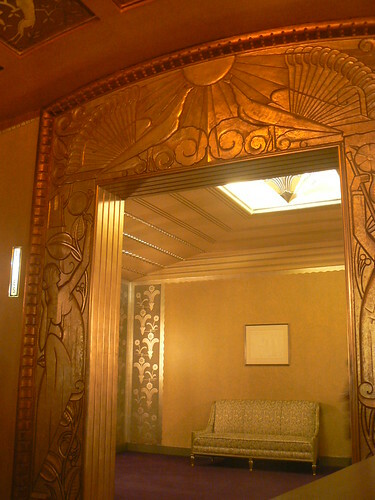 The main decoration consists of a series of six Art Deco panels. The people working in the ticket booth and concession stand welcomed me to the theatre and were pleased that I was taking an interest in it. There was a session on so they couldn't let me take photos in the main cinema but they encouraged me to have a look at the upstairs lobby. I like the unusual shape of the openings at the top of the stairs and the detail of the metal work in the ballustrade. 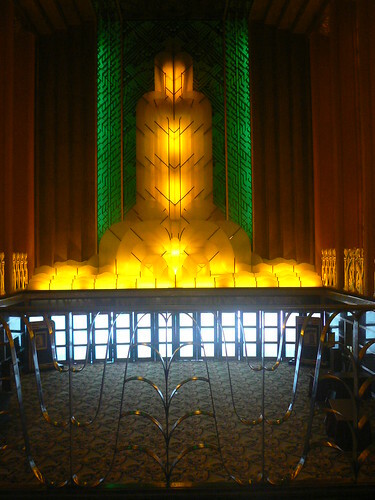 The final part that I want to show you of Oakland's Paramount Theatre is the grand lobby. This representation of a goddess with her attendant handmaidens take up the side walls of the grand lobby and to understand the scale of the space I estimate they are about 1 metre (slightly more than 3¼ feet) tall. The close-up view shows the details of the figures, the stylised nature of their faces and long hair. 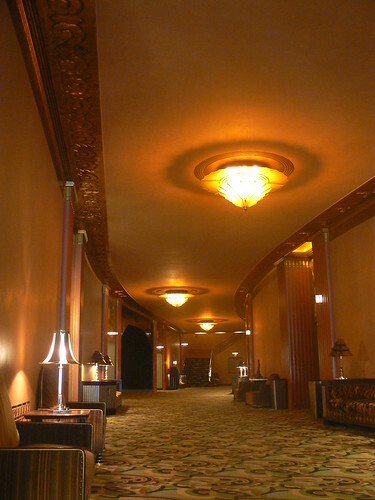 The ceiling and one end of the lobby use the same type of metal fins used in the auditorium to provide the decoration and dampen the din of the theatre-goers in the space below. 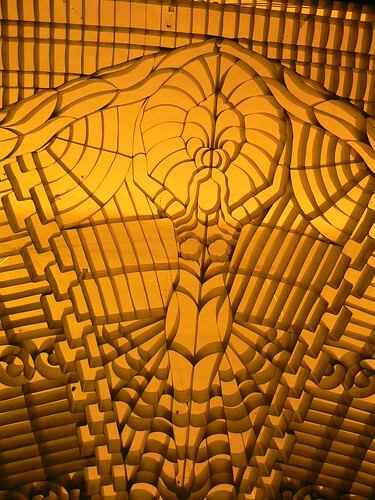 This decoration was designed by Gerald Fitzgerald whose preliminary designs were also used for the facade decoration and the bas-reliefs in the auditorium. 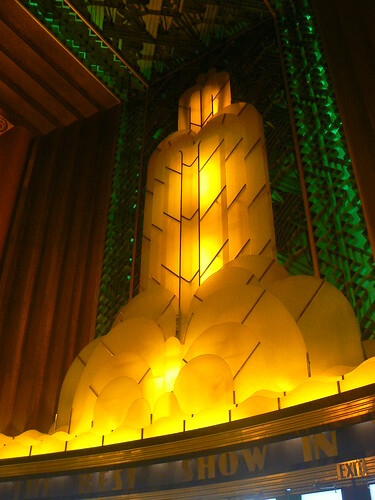 The principle piece of decoration designed by Fitzgerald for the theatre is the glass 'fountain of light' above the main doors opening onto the street from the grand lobby. 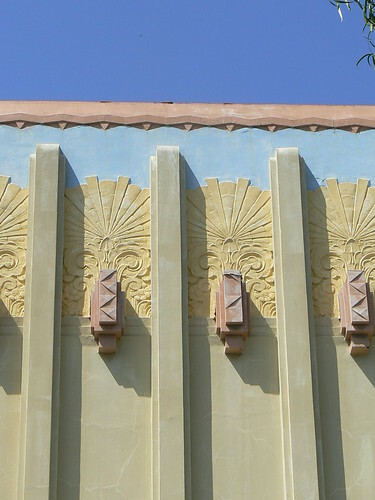 It is a monumental and, along with the facade, is a defining feature of the Paramount Theatre. 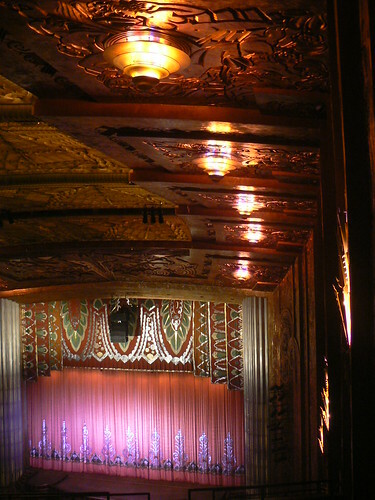 Over the past few days I have posted photos of the exterior, toilets and auditorium of the Paramount Theatre, Oakland. 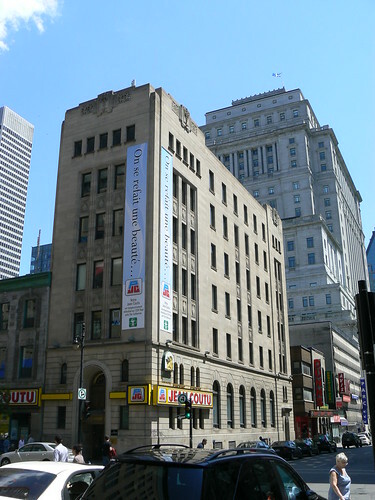 Miller & Pfleuger, the architectural firm responsible for the design of the theatre, appointed Theodore Bernardi to oversee the artistic elements of the theatre. 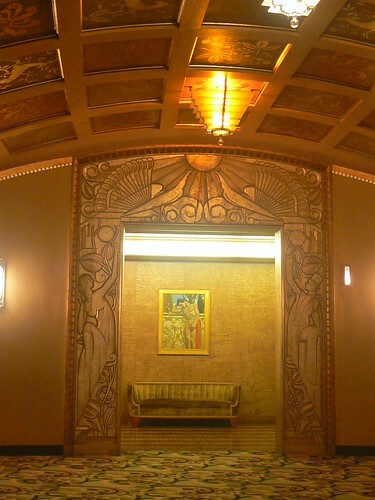 These photos show aspects of that program from various parts of the interior of this 1931 Art Deco gem. 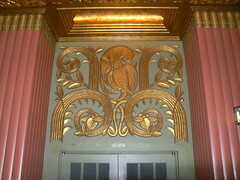 Above the doors leading to the auditorium the decoration includes two parrots perching in stylised foliage. Those doors lead off this lavishly furnished passageway. 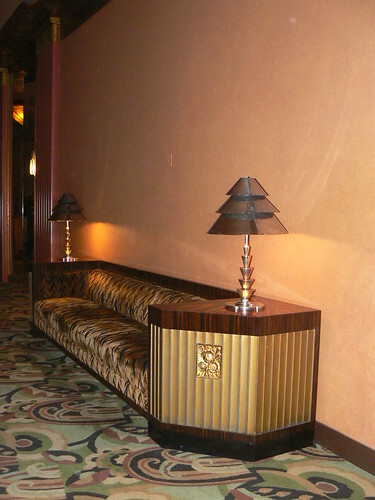 And who wouldn't want to park themselves on a lovely piece of furniture like this waiting for the main feature to start. 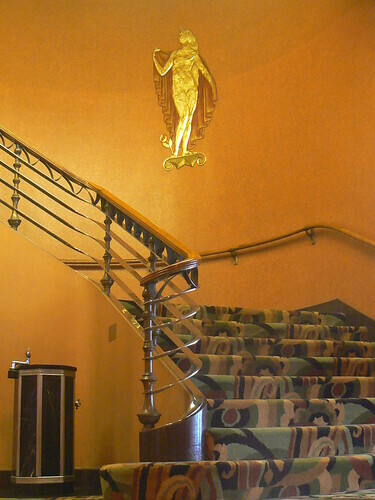 The balustrades on the stairs leading to the circle show exquisite Art Deco detailing. 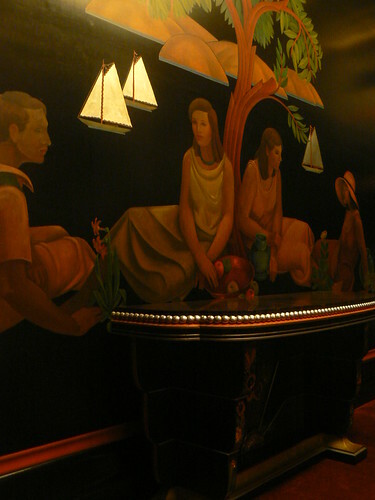 And in the lower reaches of the theatre building there was a woman's smoking room decorated with this mural by Charles Stafford Duncan. 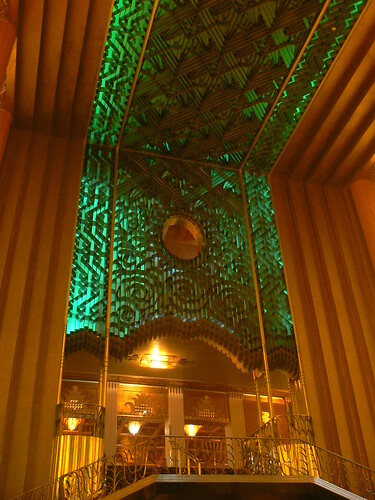 Continuing my posts on the Paramount Theatre in Oakland, today I'm looking in to the upstairs foyer and toilets. This photo (above) shows the entrance to the ante-room leading to the Ladies toilet. 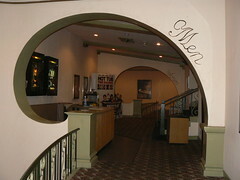 Both the Mens and the Ladies have these wonderfully decorated entrances. A pair of peacocks worshipping, seemingly, a sunburst at the apex of the opening. On either side, a male and female figure dressed in period finery. 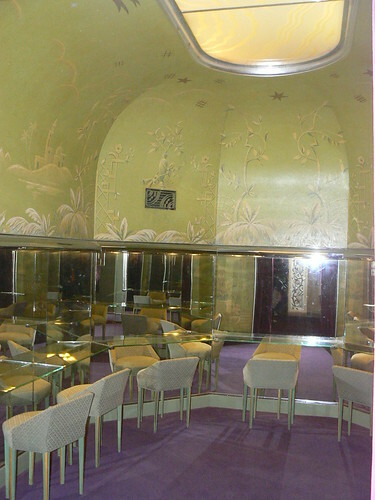 Beyond the ante-room, the ladies are provided with a powder room. 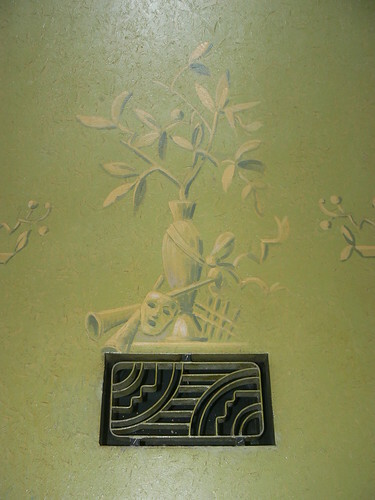 Here we can see a suitably Art Deco styled vent. 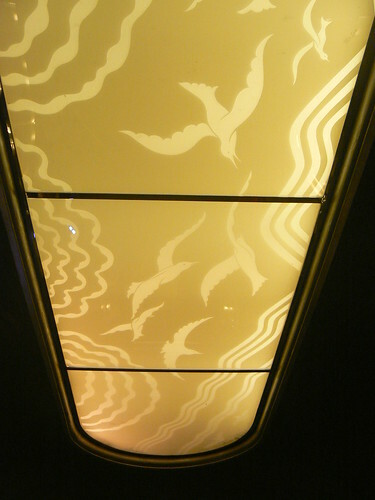 and a large skylight depicting seabirds. 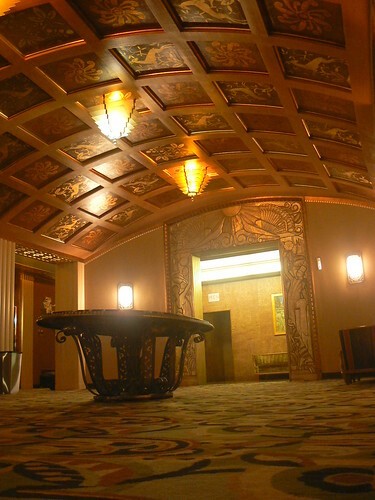 The foyer linking the two toilet areas has a curved ceiling with heavy beams creating square niches for decoration of abstract patterns, stylised floral patterns and deer or antelope. Across the foyer we can see the entrance to the Mens toilet and the ante-room beyond. 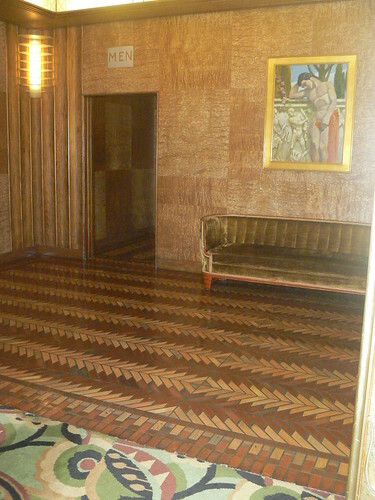 Unlike the Ladies ante-room which is carpeted, the Mens' has a fantastic tile floor. 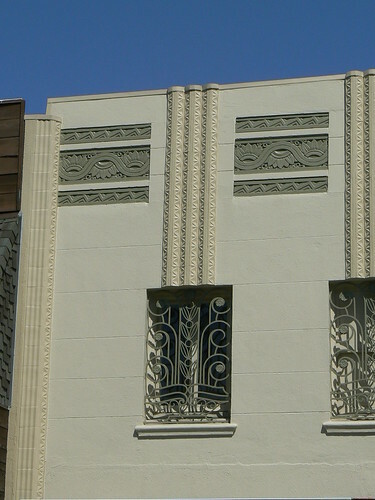 On Wednesday I wrote about the exterior of the Paramount Theatre in Oakland. 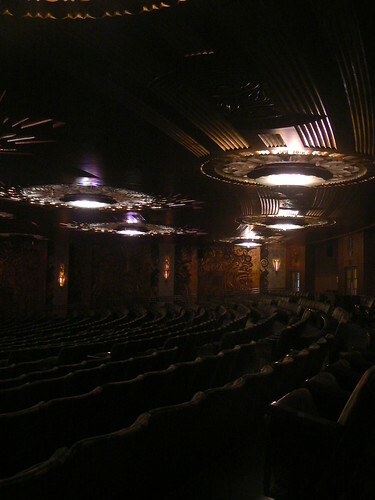 The theatre was designed by Timothy Pflueger and celebrated its opening with a gala premiere on 16 December 1931. 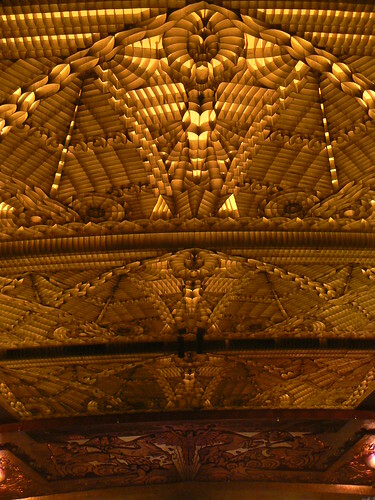 The auditorium was designed to seat 3,600 people and my photo of the back rows of the stalls (above) gives a taste of the lavish decoration of the lighting and on the ceiling and walls. The view from the circle, however, is breathtaking. 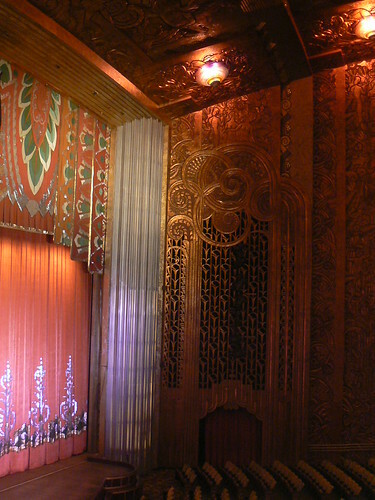 Pflueger brought Dorothy Wright Liebes onto the project as a special consultant on textiles and she would have had major input into the main stage curtain but it was Michael A Goodman who drew and painted the decoration. 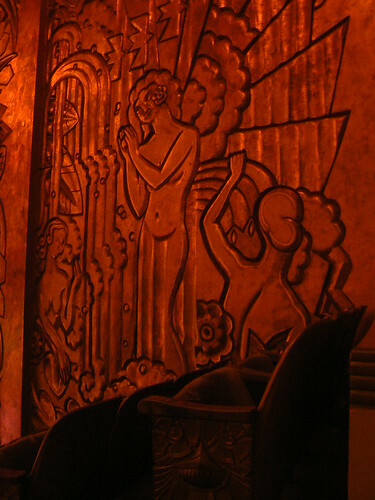 Gerald Fitzgerald, who produced the cartoons that were used for the decoration on the facade of the theatre, also created preliminary designs for the bas-relief sculptured panels on the walls of the auditorium. 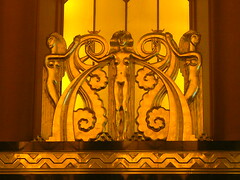 The panels were executed by Robert Boardman Howard. 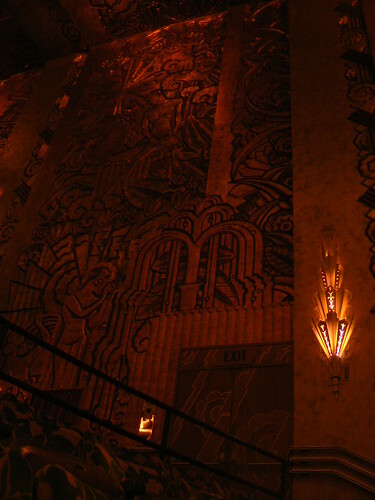 Howard worked with Ralph Stackpole on the ceiling panel above the proscenium depicting the Greek god Poseidon. The main part of the ceiling is constructed using metal fins to help with the accoustics. 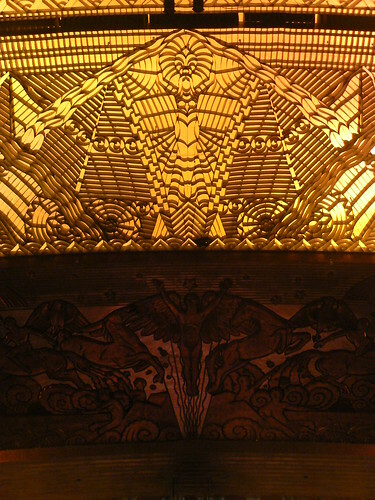 The fins arranged in a stylised representation of the Egyptian goddess Isis repeated across the five panels making up the rest of the ceiling.